When higher weight capabilities are required from a floor lift, the Prism Medical FGA-700 Bariatric Floor Lift is your product of choice. 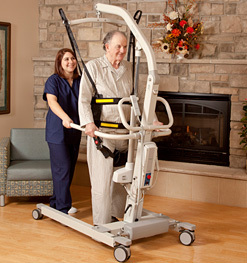 The FGA-700 can be used in gait training as well, delivering a smooth yet stable support during therapy sessions. The unique quick release design for the carry bar allows for easy removal, and the double support bars deliver strength and positioning other products do not. The base design offers stability and easy adjustment for worry free operation. 360° turn capability of the carry bar delivers the most caregiver control during lifting and positioning without interference with the mast or boom. 24 VDC, 9.7 Amps Max. Standard maximum load 700 lbs.